Join Us for Our Annual Celebration Of Thanks For Members Of The Bowery Poetry Club And Invited Guests, Complete With Poetry, Music, Dancing, Dinner, Drinks, and Dessert! Featuring Performances by Bowery Bob & Adam Horowitz, the Bowery Slam Team, The Haiku Guys, and Bowery DUO featuring Frankie. With a sushi & pizza dinner, boutique desserts from Aja AlchemybyKathy Valentine, andTito's Handmade Vodka cocktails from our presenting sponsor. 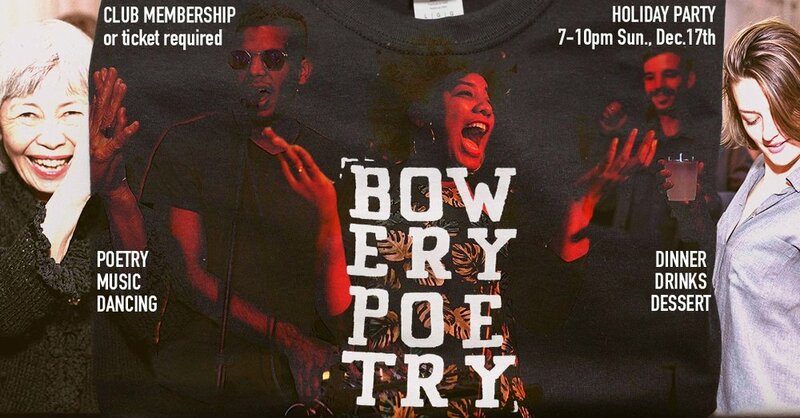 Join our Bowery Poetry Club Membership Program to receive two tickets to the Holiday Party, and free admission to PoetNY OpenMic & Bowery Slamall year. Support your non-profit Bowery Poetry Club and POETRY YOUR FACE OFF. Ram Devineni, Sophie Ellsberg, Bowery Bob Holman, Nikhil Melnechuk, Willard Morgan, Joshua Raff, Chuck Smith, & Lilly Wei. This is event is made possible by the generous support of Tito's Handmade Vodka. Banda Popular de Jorge Bueno.